Editor’s note: This story was updated at 11:26 p.m., Wednesday, September 6, in order to reflect the latest forecast and evacuation data. 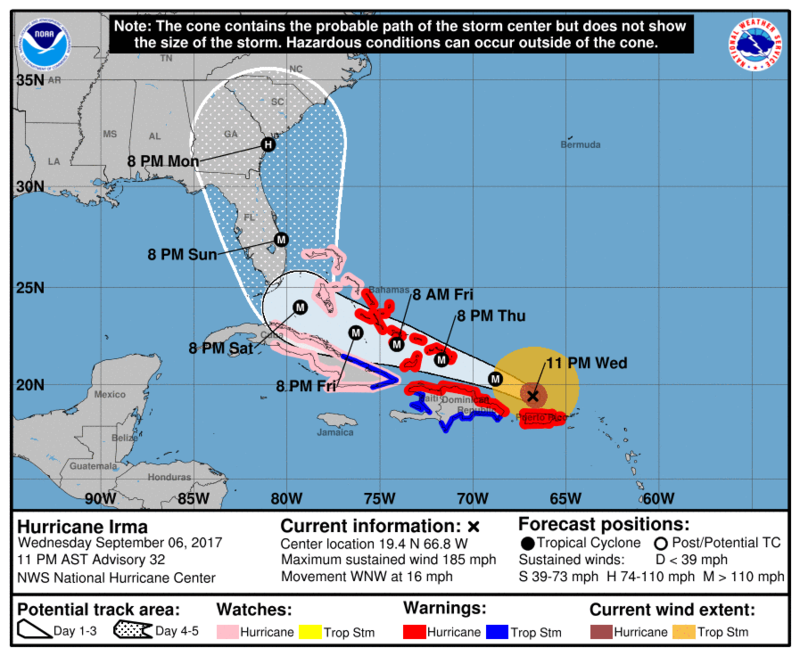 The projected track of Hurricane Irma, as issued by the National Hurricane Center at 11 p.m. Wednesday. Graphic: NOAA. 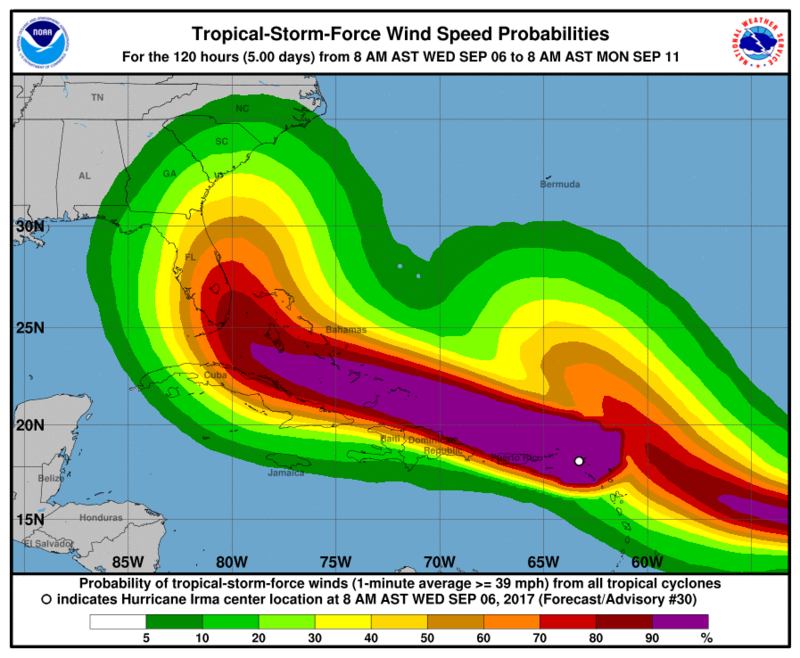 Fort Lauderdale, FL – Hurricane Irma now threatens the Florida east coast, according to the National Hurricane Center, and forecasters announced they would likely begin issuing hurricane watches for the Florida peninsula on Thursday. The system will impact South Florida, and Florida’s Turnpike, by as early as Friday evening, and to forecasters say the massive category 5 storm could inflict ‘catastrophic’ wind and rain damage to affected areas into early next week. The storm moved over the eastern Leeward Islands overnight Wednesday morning, making landfall on the British Virgin Islands, and dealing a blow to Puerto Rico, shortly thereafter. The storm is expected to continue to barrel its way on a west-northwesterly trek through the Caribbean through the next two to three days. The forecast wind field impact timeline for Hurricane Irma, through Sunday. Whether the storm remains off shore or strikes the peninsula, it will have a significant impact on South Florida, forecasters say. Graphic: NOAA. The problem for Florida comes this weekend, and particularly Sunday evening into Monday morning, when the storm is expected to slip to the west of a high pressure ridge, allowing Irma to turn to the north. Forecasters do not have a firm handle on precisely where the turn will happen. If Irma turns sooner, rather than later, the eye wall would remain offshore of Florida’s peninsula. However, the massive storm, which has winds extending out 175 miles from its center, is expected to impact Florida’s east coast, whether off shore or not. That means regardless of whether the storm makes landfall, its impact will be unavoidable. That forecast, and the storm’s potential for a life-threatening impact, have forced officials across South Florida to issue mandatory evacuation orders. Visitors in the Florida Keys were ordered to evacuate beginning Wednesday morning, and residents went under a mandatory evacuation Wednesday night. Residents of low-lying and flood-prone areas of Broward County, which includes areas of Pompano Beach and Fort Lauderdale’s beaches, also are under a mandatory evacuation order beginning Thursday. Miami-Dade County issued evacuation orders later on Wednesday for much of its barrier islands, which includes Miami Beach. Meanwhile, tolls were suspended Tuesday afternoon for all Florida toll roads and bridges. Governor Rick Scott issued the order around 3:30 p.m., saying the move was necessary to help residents and visitors easily evacuate if necessary. The Homestead Extension of Florida’s Turnpike, which runs through Miami-Dade County, was already showing heavy traffic at its south end, in Florida City and Homestead, where residents and visitors fleeing the Florida Keys will connect with the roadway to evacuate. Chad Huff, spokesman for the Florida Department of Transportation, said officials had not made a decision to change the traffic pattern on the turnpike, although that contingency does exist to aid evacuation. However, he could offer no timeline on when any decision to change the traffic flow would be made.